9x19mm Parabellum (9mm NATO, 9mm Luger) is the most commonly used handgun caliber for defense among military forces, police, and civilians worldwide. In this guide, we'll give you our picks for the best 9mm ammo for self-defense and range practice. We'll also give you a breakdown of how we came to choose these picks. To do this, they shot 5 rounds of various ammo choices using a S&W M&P9C at ballistic gel covered by heavy clothing barriers. All shots were fired about 10 feet away. Penetration Depth - The FBI recommends a penetration depth of 12 to 18 inches. Shallower penetration may not reach the vitals of an attacker, and deeper penetration can over-penetrate your target—making it more likely that you cause accidental harm to bystanders. With that said, I tend to prefer ammo with an average penetration on the deeper side of the FBI's recommendation. Bullet Diameter - Expanding hollow-point ammunition is designed to improve stopping power by transferring more energy to your target. However, ammo that expands too large, too fast, can hurt penetration. Therefore, it's generally best to choose ammunition with the largest expanded-bullet diameter that still offers a penetration depth that reaches 12 to 18 inches. Velocity - If self-defense ammo performs well in the two above factors, I'm not as concerned about velocity. The exception to this is when velocities really start to get on the low side, as they may not function reliably in heavier handguns. Before jumping into the picks, we should point out that hollow-point ammunition is far more expensive than FMJ range ammo. In my opinion, it's not a place to go cheap, as the performance of this ammo may be used to save your life. With that in mind, we didn't factor price into our considerations too much. Ideally though, you would be able to occasionally shoot the hollow-point ammunition you plan to use for concealed carry at the range. This allows you to ensure your handgun can handle it and keeps you confident shooting this ammo. Also, some of this is +P ammunition. Check your owners manual to be sure your gun is rated for +P before using this ammo. Lastly, 9mm self-defense ammo is less readily available than FMJ; so you may need to check around multiple websites if your choice is out of stock. This ammo is regularly available, has the second-largest expansion on our list, and the second-highest velocity. This nickel-plated brass ammunition has become my go-to for concealed carry and 9mm defensive purposes. Average Expanded Diameter - .66"
They also make this in 147 gr, but its gel test statistics aren't as favorable. Federal also makes 124 gr HST 9mm ammo that's not +P. This will cause less wear on your pistols, but at the cost of bullet expansion and velocity. Average Expanded Diameter - .61"
Unfortunately, these seem to less often be stocked, but they were the best performing ammo in terms of bullet expansion and are in the sweet spot in terms of penetration. I've only shot one box of these, but had no issues, for what that's worth. Being 147 gr, they do have a lower velocity than the lighter rounds. Average Expanded Diameter - .74"
Remington's Golden Saber 124 gr +P ammo is a great alternative to Federal HST +P, performing similarly in Lucky Gunner's tests. For range ammo, I look for cheap and reliable brass-cased ammunition, as brass causes less wear to your pistols (see brass vs steel ammo). I'd also highly recommend buying it in bulk online, as you can save substantially on a price per round basis. For those that don't shoot often, it's still a good idea, as ammo lasts a very long time when stored correctly. Blazer Brass 115 Grain is my choice for the best 9mm practice ammo, as it's mostly what I use at the range. It took thousands of round before having my first potential ammo-related malfunction, but I didn't even investigate too closely. In other words, this could have been a malfunction related to the gun. This stuff is some of the cheapest brass ammo, while still being VERY dependable. You can also find it for around the same price in 124 Grain. While writing this article, I decided to check and see what brass-cased options I could find for even cheaper than the ammo I usually shoot. 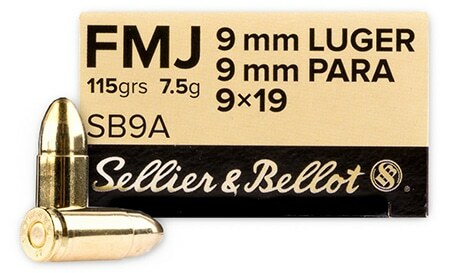 And this lead me to find Sellier & Bellot 115 gr, the cheapest (brass-cased) per round option on Lucky Gunner. Though I haven't shot this myself, I just bought 1,000 rounds to test after reading the reviews. It has 5 stars in over 300 reviews, with many recent reviews praising it. I'll update this with my experience, but it seems to be the current cheapest 9mm ammo that's high quality. UPDATE: Made it through the 1000 rounds of 115 grain Sellier & Bellot fairly quickly. I had no malfunctions or issues related to this ammo or otherwise, shooting it mostly with my (super dirty) SIG P320 and Glock 17. I'll definitely be using this ammo regularly so long as it stays at least as cheap as the other listed options. You can also find cheap bulk Sellier & Bellot 124 Grain. My last pick is another option that I've shot for thousands of rounds: American Eagle 115 gr 9mm made by Federal. My local indoor shooting range always has this, so I've used it a bunch when I forgot my own ammo or didn't bring enough. It's performed as well as my usual Blazer Brass and can be purchased online for roughly the same price. It can also be found in 124 gr or 147 gr, at a slightly higher price per round. Hopefully this article helped you find some great hollow-point and range ammo! If you decide you want a new handgun to shoot it, check out our lists of the best 9mm pistols and the best 9mm single stack pistols.